The land of hill stations, breathtaking mountains and dense rich forests, Himachal Pradesh is assuredly a natural wonder of India. Therefore, it has gained immense popularity amongst tourists all over the world. Today, it is no wonder Himachal Pradesh is one of the most visited states in the country. But do you know this mesmerising state is also rich in diverse wildlife? Yes, for wildlife lovers and photographers, it harbours a lot of places where you can spot some of the most beautiful species. If you are looking for such an amazing destination amid the hills and forests of Himachal Pradesh, then you must consider visiting Kugti Wildlife Sanctuary. Read on to learn in detail about this wonderful sanctuary and how to reach it. As the region in and around Kugti Wildlife Sanctuary experiences a bearable climate throughout the year, it is a year-round destination. However, the best time when the beauty of this astonishing sanctuary is at its summit is from August until the end of March. With an average elevation of about 11000 ft, Kugti Wildlife Sanctuary is located near the Chamba region of Himachal Pradesh and was established in the year 1962. It is one of the largest sanctuaries in the state and is blessed with some of the rarest species of flora and fauna. It is home to several valuable medicinal plants. Covered with deodar forests and coniferous vegetation, it is one of the few places where you can witness the richness of the state. From rare plants to endangered animals, there are more than 200 species of flora and fauna, and hence it makes for a perfect weekend stoppage for wildlife photographers and nature lovers. If you are looking forward to travelling offbeat and exploring the hidden corners of Himachal Pradesh, then Kugti Wildlife Sanctuary is one place you must visit. Kugti Wildlife Sanctuary is one of the least-explored places in Himachal Pradesh. Therefore, every traveller must visit it. 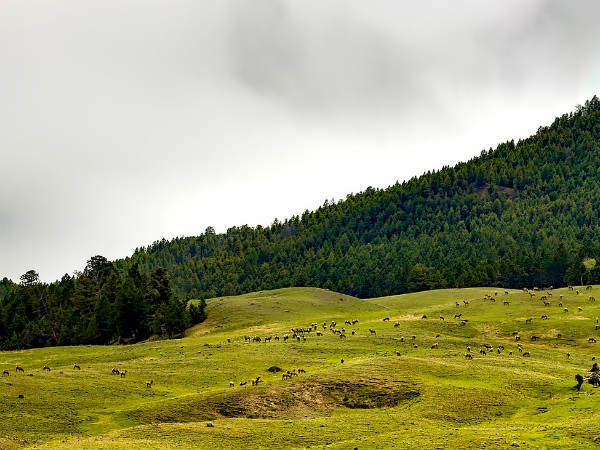 It is one place where you can spot the endangered Himalayan Tahr. Other species which can be spotted and captured on your camera include snow leopard, Indian serow, brown langur, ibex and Himalayan yellow throated fox. Do you know the region of Kugti Wildlife Sanctuary also houses the popular Manimahesh Temple which is visited by thousands of Hindu devotees every year? If you are looking forward to exploring beyond the boundaries of this enthralling sanctuary, then you can also plan a tour of the incredible and eye-soothing hill station of Bharmaur. It is located in the close proximity of the sanctuary. By Air: The major nearest airport to the sanctuary is located in Jammu at a distance of about 278 km. From Jammu, you can either take a direct cab to the sanctuary or take a bus to Chamba and then from there, a cab to the sanctuary. Chamba is located at a distance of about 210 km from Jammu and 72 km from the sanctuary. By Rail: To reach Kugti Wildlife Sanctuary by rail, you need to catch a train to Pathankot railway station, the nearest railhead to the sanctuary at a distance of about 190 km. From Pathankot, you can either use public transport or hire a direct taxi to reach the sanctuary. By Road: The road network around Kugti Wildlife Sanctuary is well maintained. Therefore, you can easily reach it by road.